Tom Nelson: Photo: New ice core source forming on Lonnie Thompson fan John Paskievitch? Photo: New ice core source forming on Lonnie Thompson fan John Paskievitch? Two researchers and their pilot were rescued Friday from a remote Alaska volcano after freezing rain left thick ice on their helicopter's blades. Alaska State Troopers spokeswoman Megan Peters said the rescue came at about 5 p.m. Friday. The three were caught in a freezing rainstorm Wednesday evening. Pilot Sam Egli, United States Geological Survey geophysicist John Paskievitch, and University of Alaska-Fairbanks researcher Taryn Lopez were not injured. 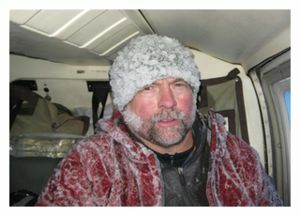 John Paskievitch aboard the stranded iced-over helicopter. "[Lonnie Thompson has] put this really solid climate history picture together from data collected from ice cores all over the world," said [John] Paskievitch, a seismologist with the Alaska Volcano Observatory who's worked on ice-coring expeditions to Antarctica. "There are global climate issues and regional climate issues. ... To get the full global perspective, you need to get these data points around the globe."